Admission into the graduate dental hygiene program is on a competitive basis, qualified applicants will be contacted for a personal interview with the Graduate Dental Hygiene Admissions Committee. You will be notified in writing as soon as all forms and credentials have been received and evaluated. The deadline for applications is February 1; classes begin in the summer semester of each year. Read and fully complete an UMKC online application which has a $45.00, nonrefundable application fee. The application ust be received in the division of dental hygiene office by the deadline of February 1. 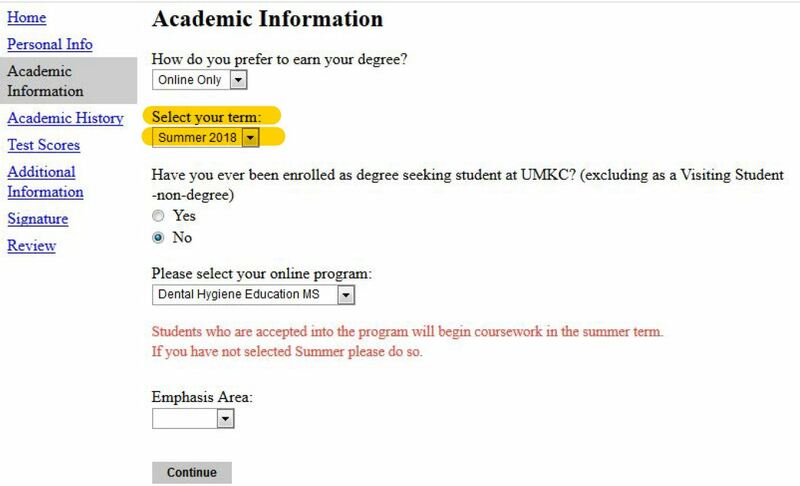 When completing the UMKC application, please select the summer semester as the starting semester. NOTE: Failure to complete the form fully and accurately may void the application, and subsequent revelation of inaccurate or incomplete information of substantive nature may result in dismissal. Request official transcripts of all your previous academic work, and submit through the UMKC online admissions web site: https://futureroo.umkc.edu/apply/ Transcripts must be submitted by the deadline of February 1. The directors reference form, reference forms, and the supplemental application can all be found in the UMKC online application. Submit three (3) references from college faculty members/administrators who can inform us as thoroughly as possible of your academic and personal qualities and achievements as a total person. One form must be completed by the Director of the Dental Hygiene program from which you graduated. The reference forms must be submitted through the UMKC online admissions web site, https://futureroo.umkc.edu/apply/ Reference forms must be submitted by the deadline of February 1. Submit a completed Supplemental Application form through the UMKC online admissions web site, https://futureroo.umkc.edu/apply/ . The application must be submitted by the deadline of February 1.
International applicants are not eligible to apply to the DHE MS program. You will be notified in writing as soon as all forms and credentials have been received and evaluated. Core curriculum courses are taken in conjunction with students enrolled in the UMKC degree-completion program. In addition to a UMKC campus program orientation, usually consisting of 1.5 days in August, online students are required to attend on average, an additional two times during the students program of study held on the UMKC campus. More information on these campus visits can be discussed with the program director. Additionally on- site campus visits for the graduate student are determined between the research committee chair and the student. The student is encouraged to attend another on-campus visit as their research project deems necessary. Some courses (DENT-HYG 5510 Student Teaching and Conference I and DENT-HYG 5530 Clinical Instruction and Conference I) require teaching (didactic or clinically) at a college/university setting. For students who do not reside in the Kansas City area and cannot utilize the UMKC /SOD an affiliation agreement is required. It is the student’s responsibility to get permission from the sponsoring institution to teach in their facility. Once the student has initiated contact, the UMKC program director will contact the program director of the sponsoring institution. The total number of credit hours required for completion of the Master of Science Degree Program in Dental Hygiene Education is 36 credit hours for either the thesis or the non-thesis option. The 36 hours include the UMKC Division of Dental Hygiene Core Curriculum (required courses). A minimum of a 3.0 GPA. Successful completion of 36 credit hours with a thesis or graduate research project option. Design and disseminate to other professionals appropriate to your area of research a scholarly presentation at a regional, state, or national conference with other health professionals. 5. Successful completion of a portfolio as presented in DENT-HYG 5585. The final portfolio must be turned into the program director 6 weeks prior to the student’s anticipated graduation date.